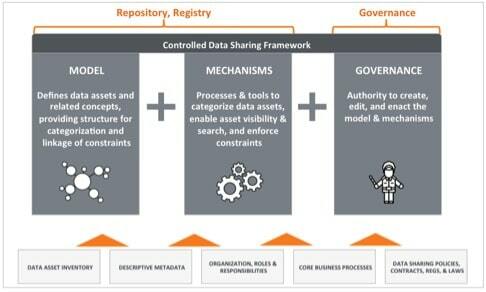 Our controlled data sharing framework enables an investment bank’s research department to easily discover and safely share valuable data assets across the department and with the Bank’s investment clients while mature data management and data governance practices allow the department to clearly demonstrate improved operational efficiencies. Our client, the Research Department within an investment bank with $90B market cap, provides analysis of companies, industries, markets, and world economies. With this information, their clients make well-timed and informed business decisions on everything from risk management to capital allocation. While our client’s research analysts generate a wealth of valuable analysis and data assets, the information is not readily leveraged across the department or with the Bank’s investment clients. The effort wasted locating data assets, understanding their contents and sharing restrictions, and, in many cases, unnecessarily duplicating work, was adding to the cost of the Research Department. The Department needed to demonstrate an improvement in streamlining their operations. The Bank turned to Sagence to clarify a path towards improved data management maturity and to enable a streamlined and controlled sharing of granular data and insights across the Research Department and with the Bank’s investment clients. Sagence led a series of workshops with the Research Department’s senior leadership. In these sessions, we elicited the leadership’s vision for industrialized data sharing practices, both within the investment bank and externally with the Bank’s clients. We prioritized the Leadership’s requirements and, based on insights from the workshop, Sagence launched a pilot program within the Research Department focusing on three areas: repository, registry, and governance. Our team interviewed analysts and other key personnel to better understand current practices and identified challenges. We first analyzed the data repository to learn who was authoring what and which data assets. After completing our inventory, we registered the assets using descriptive metadata practices. Sagence utilized our extensive data governance expertise to develop a custom framework for the investment bank’s research department that defined who could find, access, and leverage the repository’s assets. Concurrently, a technical assessment was conducted to determine what improvements would be needed to support industrialized data sharing practices. Based on the information obtained during the pilot and from the interviews, Sagence designed a bespoke framework to guide the organization through the changes required to enhance controlled data sharing practices. The framework included categorization schemes for the data assets, processes for data management, and organizational structure for needed skills and headcounts. As a result of this rapid assessment pilot, the Research Department’s leadership team now has a practical and proven operating model for the data management organization, including the appropriate processes, skill profiles, and required headcounts. The department also has a complete understanding of the technical architecture needed to support controlled data sharing practices. The Research Department has cataloged over 300 data assets now discoverable by research members; significantly enhancing collaboration, reuse, and the potential development of research products. These improvements enable the Research Department to demonstrate it is streamlining operations and improving efficiencies. Learn how Sagence’s lean data governance approach helps a health system make data-driven decisions by reducing the friction between the requesters and providers of data to enable data sharing. Learn how Sagence’s data governance services enabled a software solutions provider to generate forward-looking analyses to improve customer insights across their enterprise, cloud, middleware, storage, and virtualization software divisions. Sagence is always looking for intellectually curious, data-savvy people. Click here to view our open positions. To receive all our updates, follow Sagence on LinkedIn.